The British singer's father, mother and brother, her ex-boyfriend Reg Traviss, Sean Lennon and producers Mark Ronson and Salaam Remi were also present. Tony Bennett said he did not think that Amy's life was tragic, despite her death aged just 27. He believes that she lived a complete life because she was able to achieve her goal of becoming a respected musician. "Her dream was to become famous and a beautiful singer, and she accomplished that," Tony, 86, said at the first annual Amy Winehouse Foundation Inspiration Awards and Gala, where he received the lifetime achievement award. "Even though she had a short life, she had a great life because she ended up praying for the success that she wanted, and it happened. This is what this night's about." Amy died in 2011 from accidental alcohol poisoning. Though troubled, she was a critical darling and earned five Grammy Awards for her album Back To Black. The foundation established in her name assists disadvantaged youths, and was launched in Europe in 2011 and last year in the US. Amy and Tony won a Grammy Award last year for the duet Body And Soul. 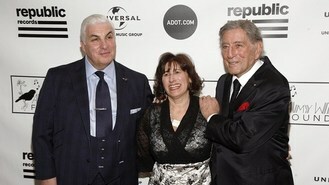 Harry Belafonte presented the award to Tony and said he had introduced him to Amy's music. Jennifer Hudson performed three songs at the event, earning a standing ovation. She called the event "beautiful" and said Amy was "such a talent, such a gift". Rapper Nas, who was nominated for a Grammy with Amy this year for Cherry Wine, also earned an award, accepting via a video message.